Led by pharmacy manager, Lesley Howard, the team at LloydsPharmacy, Chesterfield, officially opened its new concept in pharmacy on Thursday, March 6th. The Chesterfield team will now offer LloydsPharmacy's new approach to community health, which has been developed to improve access to healthcare information and support. The ribbon was cut by Thomas Gill, (pictured above, with some of the Chesterfield team) a long-standing customer of the store. As part of the transformation, the pharmacy now offers free, enhanced services for a range of conditions including skin health and pain management. The pharmacy's new skin offering covers all aspects of skin health from medicines management advice for people on prescription treatment to medicated skin products. Touchscreen computers have also been introduced so customers can research their own conditions and discover all sorts of health information and print it out to use later, which helps them with their treatment and medication. Lesley said: "We are delighted to be a pioneer in a project that will do much to raise awareness of healthcare needs at a local level. "What we want to do is help people discuss their health problems, offer support on how we can help them and how they can help themselves, all in relaxed surroundings where people can feel more comfortable talking about their concerns. "With skin conditions, a change in treatment and application techniques can make all the difference, which is why we have developed our skin advice service. With effective management, symptoms can be reduced and those with the condition can start to take back control of their life." Pain management is another area where the Chesterfield pharmacy team now offers enhanced support. The LloydsPharmacy pain control service has been found to improve 46% of people's pain after just four weeks of taking the pharmacist's advice. "We know many who suffer from long-term health conditions don't always want to go to their doctor every time they have a question," Lesley continued. "Our dedicated and experienced team is supporting local residents' healthcare needs by providing services that complement GPs and other healthcare professionals by offering convenient, one-to-one support in pleasant, modern surroundings." The nine-strong team at LloydsPharmacy, Chesterfield, is experienced in dealing with the individual healthcare needs of local residents. Many have worked with LloydsPharmacy for a number of years. Isobel Morgan has worked at the pharmacy for 36 years. Supervisor Stephen Campbell has worked for the company for 13 years, Pauline Thompson, 11 years, Julie Groves, nine years, Rob Jones, seven years and Elaine Manning, three years. 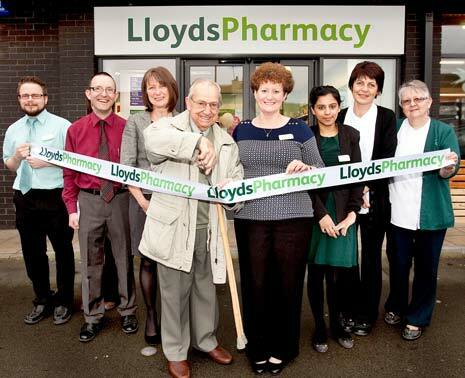 LloydsPharmacy in Chesterfield is open Monday to Friday 9am to 6pm and Saturday 9am to 1pm. To find out more about the advice and support available at LloydsPharmacy please visit 42 Chatsworth Road, Chesterfield, Derbyshire, S40 2AQ and speak to a member of the pharmacy team or visit the website www.skinwithoutcompromise.com.